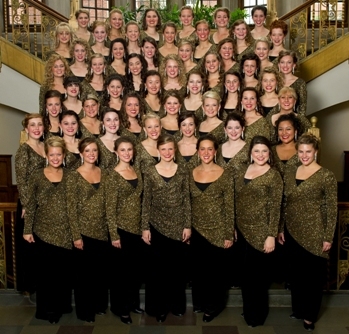 Gibson Southern Theatre is excited to bring you Purdue Musical Organizations: The Purduettes on April 15, 2012. All tickets for this one-day performance are $10. This is a general admission performance. Tickets are limited, so purchase yours today from a Gibson Southern Theatre ITS Member or on our online ticketing site. Known for an ever- polished and professional look and style, the Purduettes consistently showcase the considerable musical talents of the 50-60 vocalists through full ensemble selections as well as small groups and solo presentations. Founded in 1942, the original Purduettes heartily fulfilled previously-booked appearances of the Purdue Varsity Glee Club when the onset of World War II depleted the Glee Club’s roster. Since then, the Purduettes have continued performing for community, university, corporate, business, private, government, alumni, arts and school events throughout the state of Indiana and beyond.